Sedgewick, Alberta > Discover > News > Uncategorised > Black Knot Disease! Time to Prune! Black Knot Disease! Time to Prune! 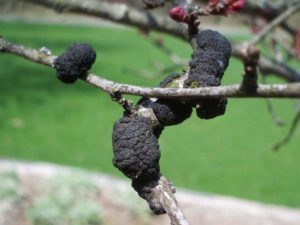 Black Knot, caused by the fungus Apiosporina morbosa, is a very common disease of plants in the genus Prunus (all Cherry genus, Mayday, Plum and Apricot). This disease reduces the aesthetic value of affected specimens, as infections spread rapidly. High levels may result in the eventual death of the plant. Prune out all knot-bearing branches during late fall, winter or very early spring when plants are dormant and knots are easy to see. Failure to remove branches beyond the internal growth will result in re-growth of the fungus. Please help stop the spread of this disease in our community!